Strawberry Cake Mix Cookies are a miniature version of strawberries and cream, the traditional English dessert. By starting with a mix, you can have a taste of spring or summer whenever you like – or you can simply enjoy strawberries and cream at picnics, on Valentine’s Day, a birthday party, or just for fun. Preheat oven to 350º F. Line baking sheets with parchment paper or silicone baking mats. Set aside. Set cream cheese in a large bowl. Using an electric mixer on slow speed, beat the cream cheese until it is smooth. Add melted butter, egg, and vanilla extract. Mix the ingredients together until they are well blended. Add cake mix in two incorporations, blending each time until pockets of the dry mixture are absorbed. Dough will be loose. With a large spoon, add white chocolate chips to the dough. Use an ice cream scoop or cookie scoop to form cookie dough into walnut-sized balls. Set them onto prepared baking sheets, 2 inches apart. Use the heel of your hand to lightly flatten each cookie. If you wish, press a few extra chips onto the tops of each cookie. Bake cookies for 8-9 minutes, one baking sheet at a time, until cookies are set. Do not over bake. Do not allow cookies to begin to brown. Remove cookie sheets from the oven. Allow cookies to sit for 3-5 minutes before using a spatula to transfer them to a wire rack. Cool completely. You can substitute light cream cheese for regular cream cheese in this recipe. If cookie dough seems to be too loose to form into balls, cover it tightly with plastic wrap and set it the refrigerator for 1 hour before baking cookies. After baking, allow the cookies to set several minutes on the baking sheet before removing them to cool on a wire rack. 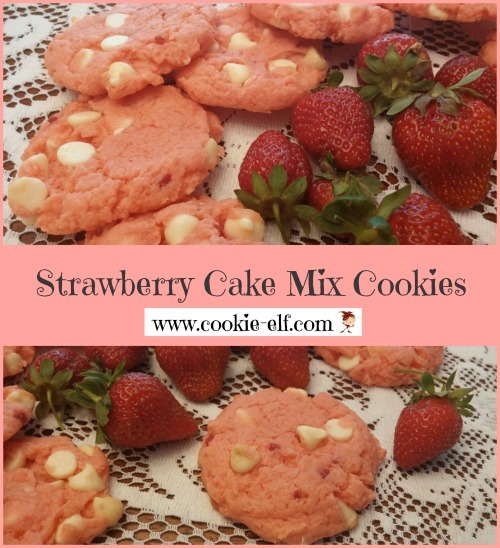 Strawberry Cake Mix Cookies have a soft texture. If you remove them from the baking sheet too soon, they will not retain their round shape. But if you let them cool for 3-5 minutes they will be set and be ready to transfer to the wire rack. Check The Elf's Cake Mix Cookies Pinterest board for more inspiration. Easy Snickerdoodles: just 4 ingredients!